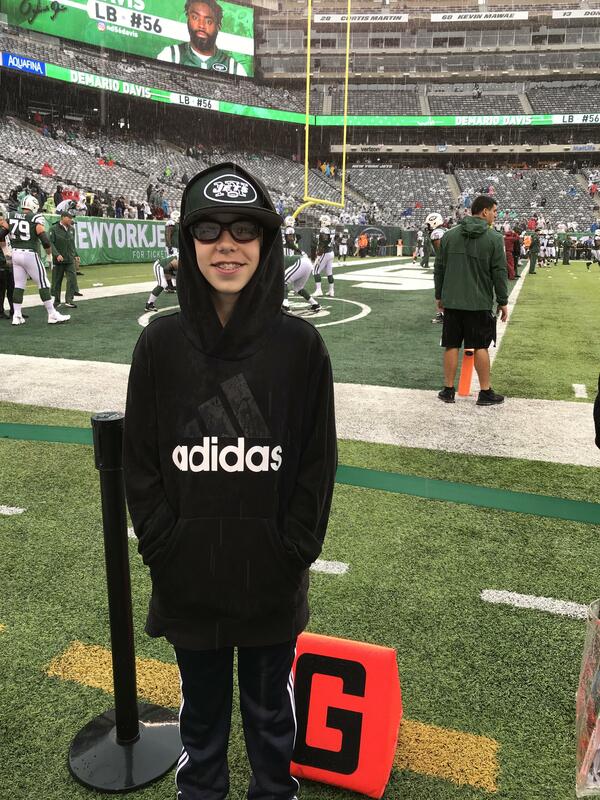 The very first football game I ever attended was a NY Jets game. I was probably around 10 and my dad took me to Shea Stadium to watch Gang Green play. I don’t remember much about the game. I don’t know who they played. Don’t remember if they won. I just remember a few things: It was freezing. The roar of the planes overhead was deafening. And after a bad call, the crowd started chanting… well, some not very nice words. 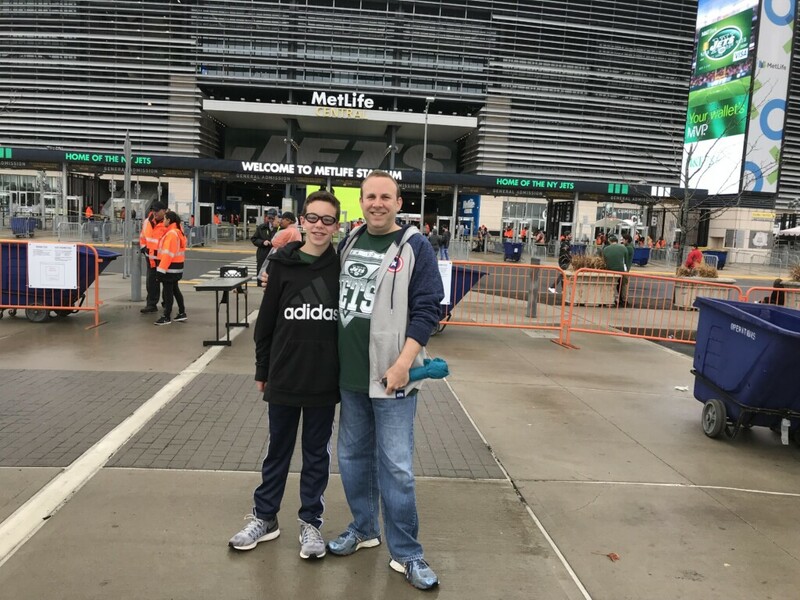 Thanks to my blogging buddy Kimberly from She Scribes, I was able to keep that tradition alive and enjoy a VIP Experience with my 12-year-old son Ryan over at MetLife Stadium where the New York Jets took on the Atlanta Falcons! Our day started at 11 am by the Pepsi Gate, where we planned to meet our group of roughly 10 other bloggers, reporters and influencers (and their +1 guests). 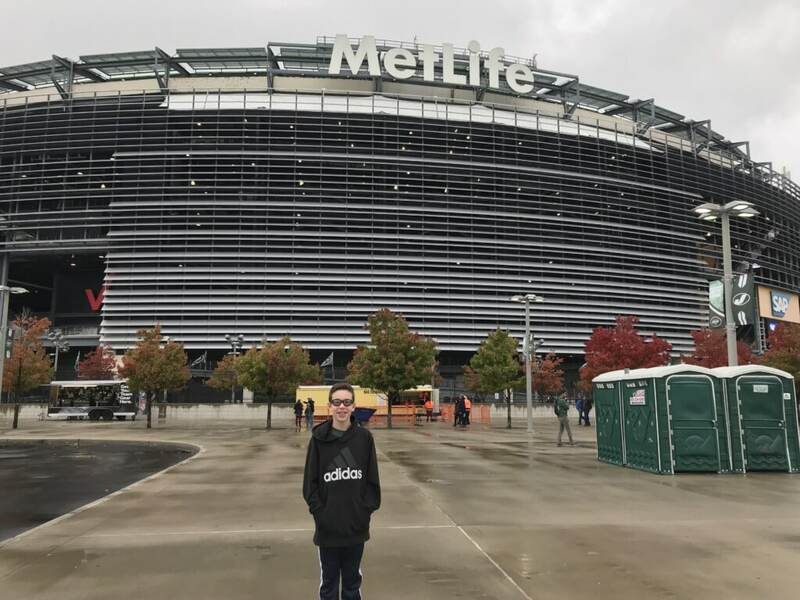 Being the nervous nelly that I am and never knowing how bad traffic will be, Ryan and I got to MetLife Stadium by 10:15 and started walking around. “This place is HUGE,” was Ryan’s first reaction. And even though a heavy drizzle started up, both of us were too excited to let a little rain dampen our spirits. Before even entering the building, we were handed an awesome swag bag filled with Jets-themed hats, ponchos (MUCH needed, thank you so much! ), sunglasses, towels and more. 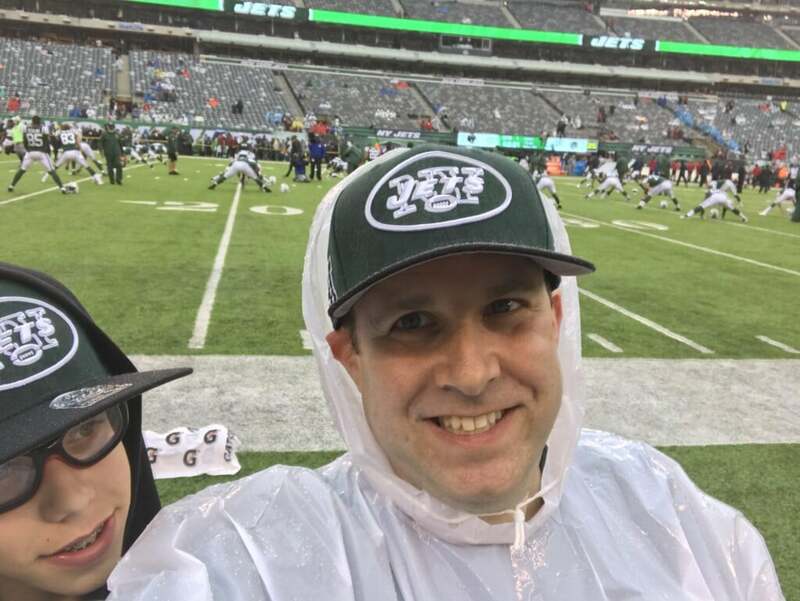 An avid sports cap collector, Ryan’s eyes bulged from his head at the Jets hat and he couldn’t size it fast enough to wear. 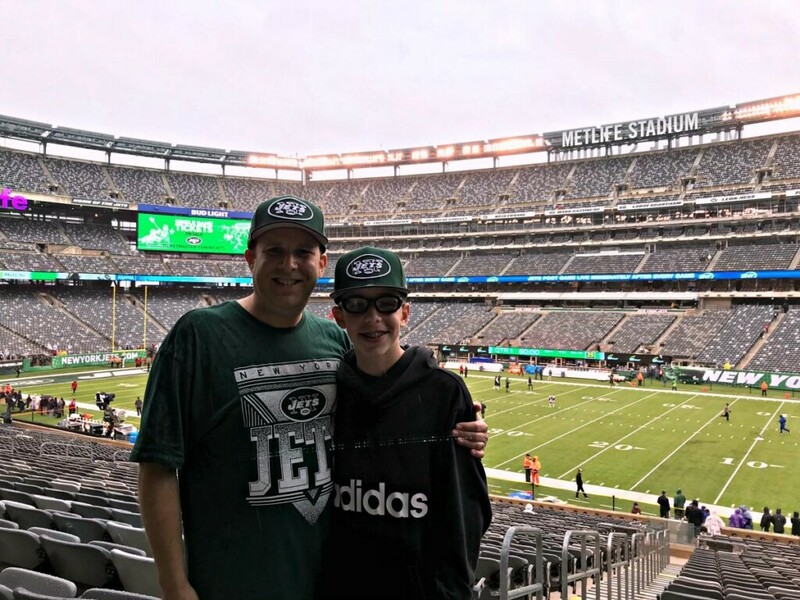 Our first stop was up in the Green Room, where we had our first taste of what the MetLife Stadium field looked like. “WHOA! We’re so close!” was all Ryan kept repeating. And we were. It was like watching a local High School game, where you sit in the stands and can easily read the lips of any of the players. But this was just a brief moment to whet our appetites. And, well, with the rain, wet our bodies too I guess. Next up was a trip to the Sharp Showcase Lounge. This is normally out on the field, but due to the inclement weather, this super cool VR station was brought inside for the day. 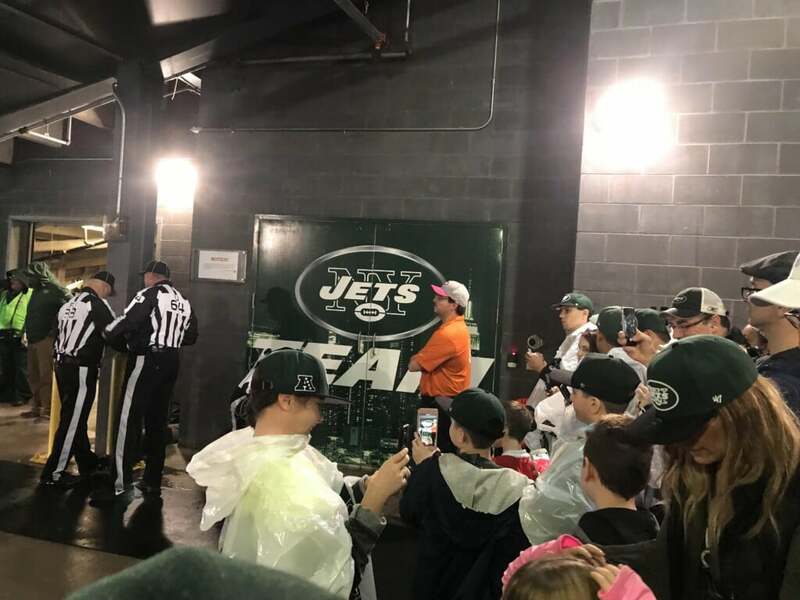 A few stations were set up to let fans interact with the Jets on a level unlike anything ever before. There was even a football passing version where you can try your luck at some passing drills. There was also an area to meet and greet Jets Legends in an informal Q&A session. 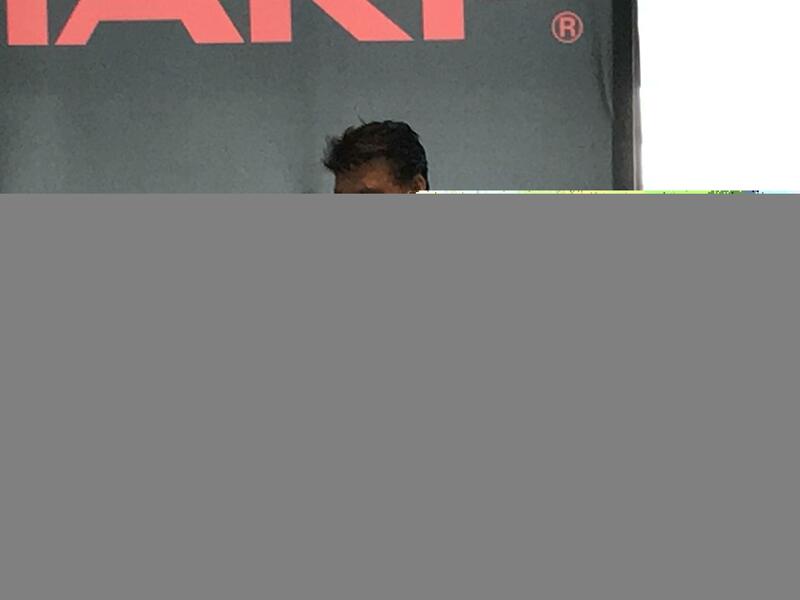 We were lucky enough to see the sackmeister himself Marc Gastineau right there while we played around with some Virtual Reality fun! 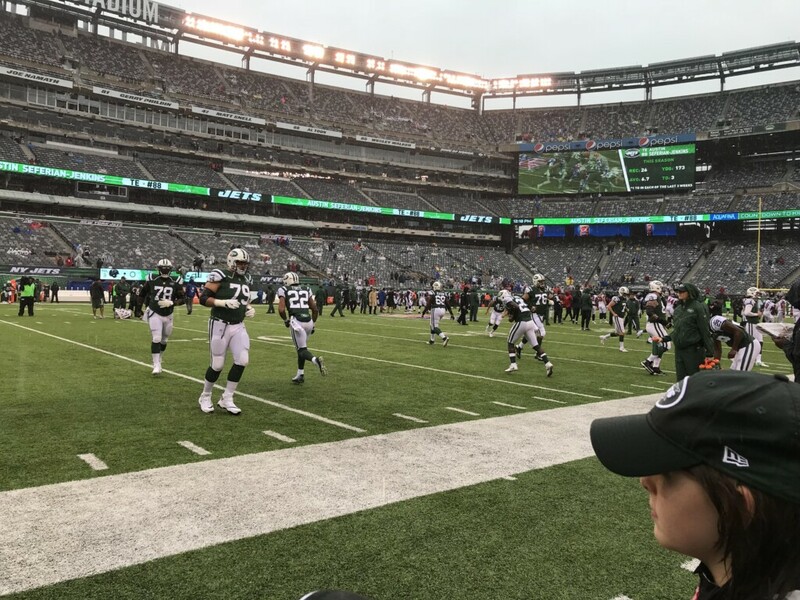 Gastineau talked about some of his toughest opponents, what he thinks is most important on the field and more than once led the J-E-T-S cheer to a roaring crowd. I wish we could have stayed longer to meet Gastineau and try out all the VR equipment, but the next leg of our tour was up and it was easily the greatest part of the day. We got to watch both the New York Jets and the Atlanta Falcons warm up before the game. Okay, sounds neat, but did I mention we got to watch them from the sidelines? On the field? Yeah, it was pretty amazing. Of course, the rain started coming down even heavier at this point. 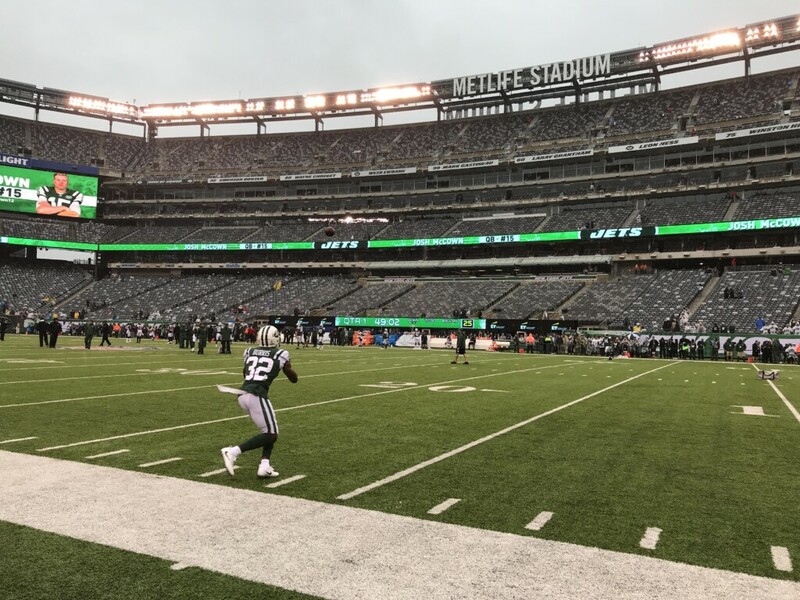 Again, super thankful for those Jets ponchos! We were literally just feet away from the players as they stretched, ran and made plays. I was crazy excited and then looked over to see Ryan watching some passing drills. The sheer awe of what he was witnessing had his eyes wide with excitement and his smile pushing past his ears. “This is so cool,” pretty much became Ryan’s mantra for the day. And it was pretty darn cool. I loved seeing the routine passing drills that I always take for granted on video games like Madden. 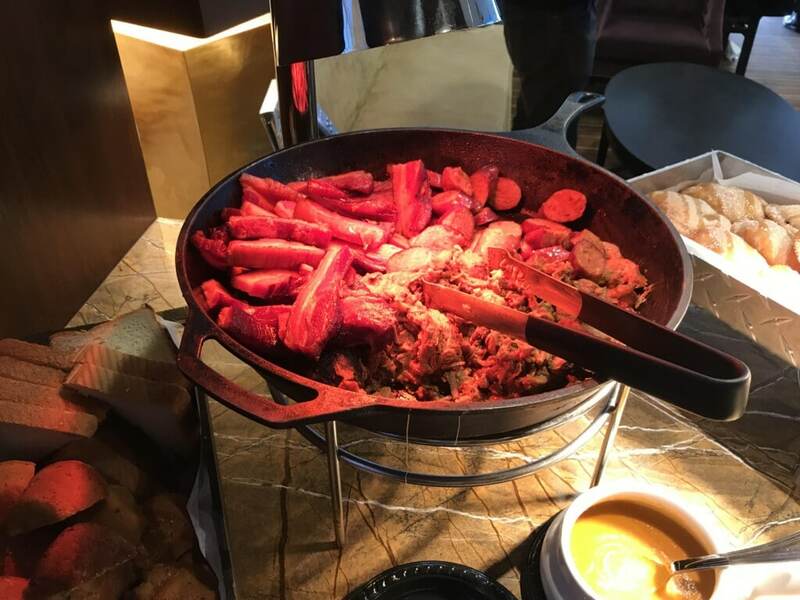 I’ve had some pretty amazing experiences thanks to my blogging connections. 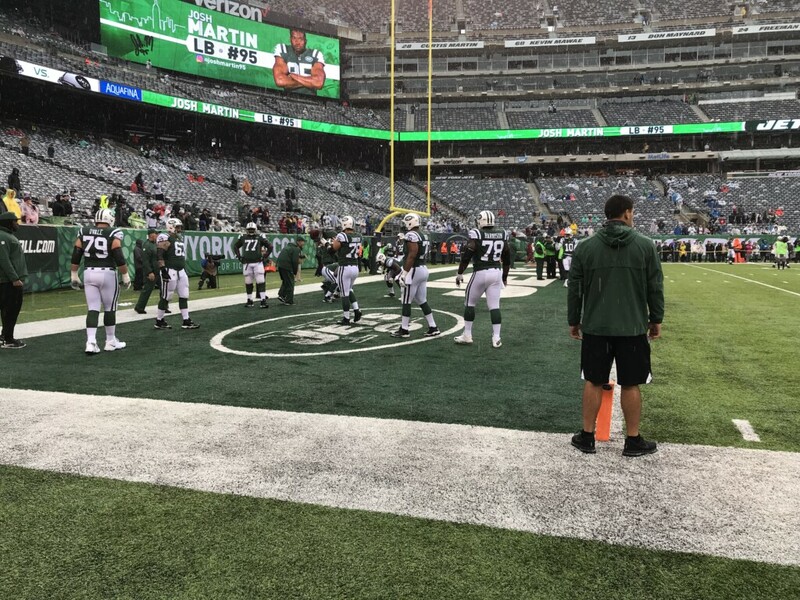 But I have to say, standing on the sidelines being “this” close to NFL players as they warmed up was definitely one of the high points. 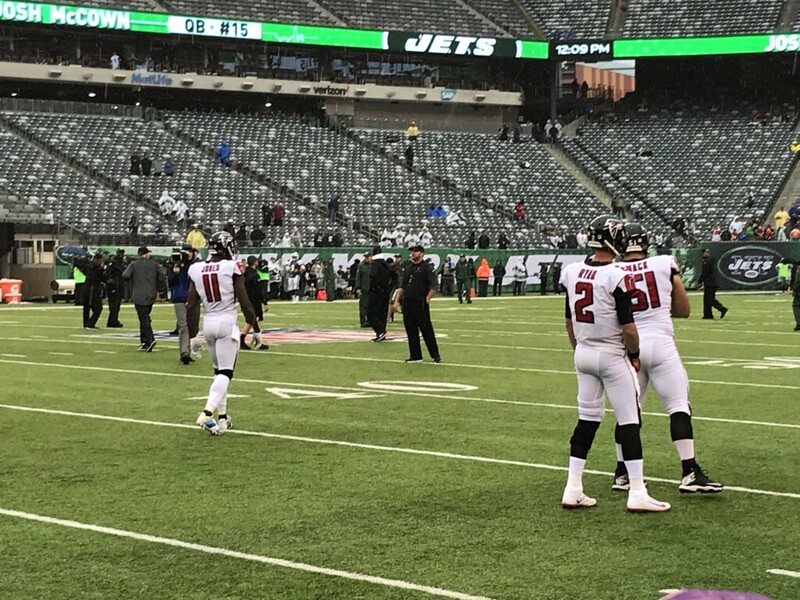 Of course we also got to see the Falcons warm up. The rain continued to bear down on us, increasing its intensity. But we couldn’t have cared less. It was just so cool seeing players right in front of you gearing up for the big game. Plus, once you’re totally soaked from head to toe, you can’t really get any wetter. Eventually the warmups ended and we headed inside. Except, we were in for a crazy special treat. We didn’t just go inside the stadium. Uh uh. We went inside the tunnel. You know, the place where the team charges out of to kick off the game with fireworks and smoke and all kinds of crazy effects! That’s where we waited. 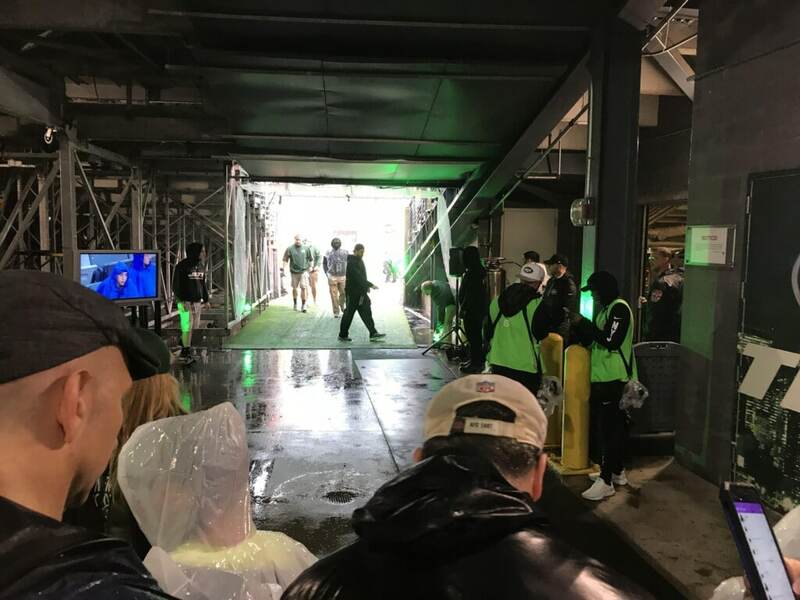 Inside the Jets’ tunnel, right near the double doors that they come out of as the introductions begin. 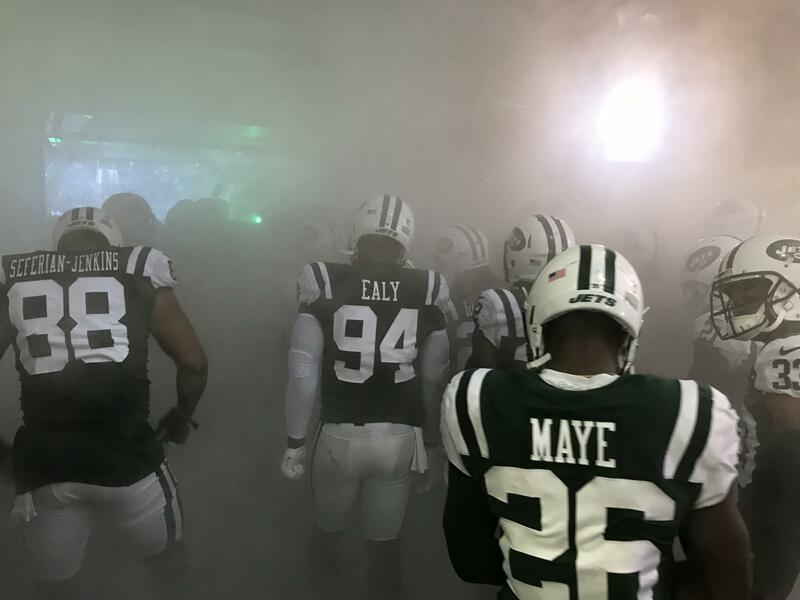 The fog machines kicked into high gear in preparation as we all waited anxiously inside the tunnel. Suddenly the double doors opened and the Jets slowly started lining up in the tunnel. Again, right in front of us. They were so close to us, you could just reach out and touch them. And actually some people did! 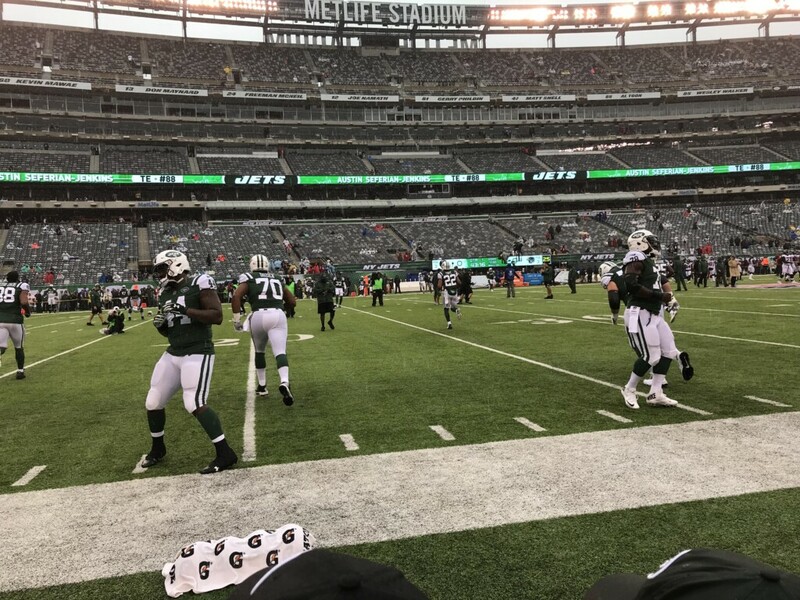 A few Jets players looked at our crowd of bloggers, got pumped up and started high-fiving the folks standing in the front. Then the call came out and the team charged onto the field. 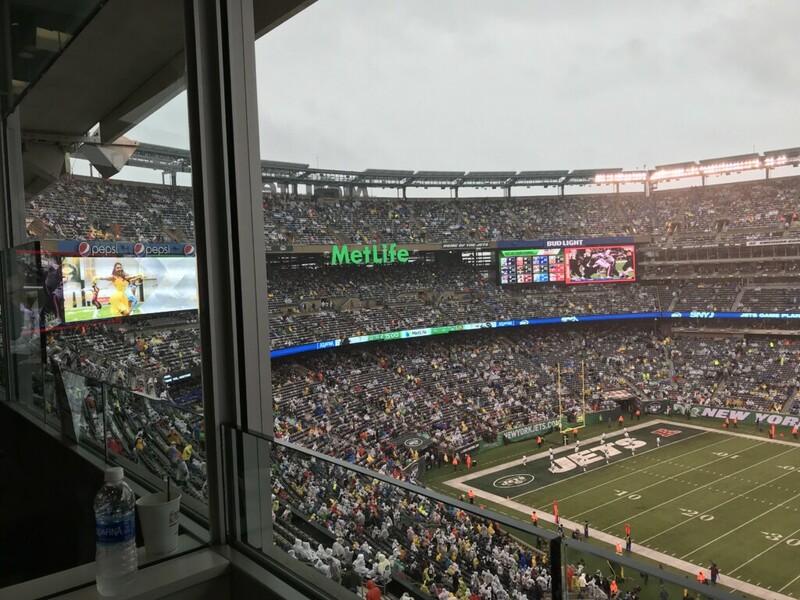 With kickoff just moments away, we raced up to our suites on the sixth floor for the game. And oh, man were these good seats. We’re talking just about on the 50 yard line. It was unreal watching a game from the box. You’d think it’d be tough following football since it’s such a large spread from End Zone to End Zone. And I’ll admit, at times, I got caught up in the instant replay on one of the four ginormous TVs in the corners of the stadium. Then I realized I was watching a TV when the real thing was right below me! You haven’t lived until you’ve seen a team toss a football some 30 to 40+ yards perfectly into a receiver’s hands as he then lunges into the End Zone. 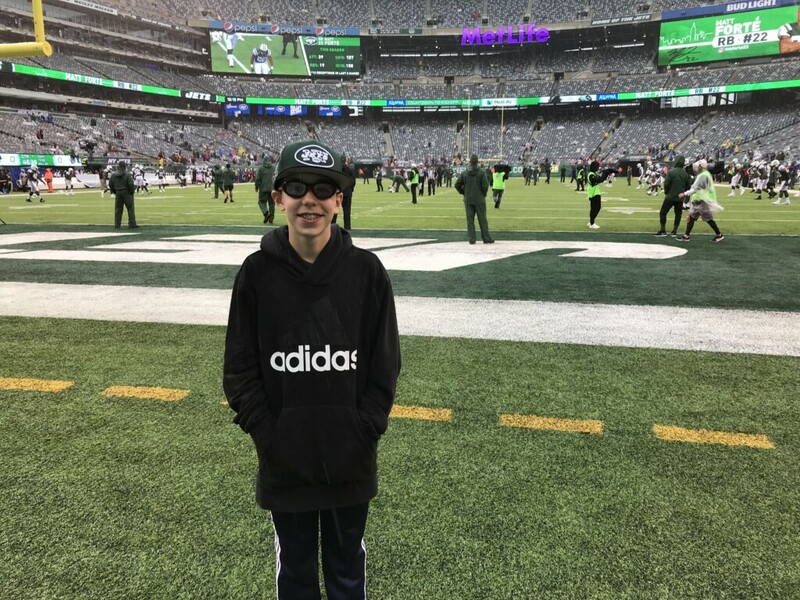 The crowd went nuts (including our gang in the box) when Quarterback Josh McCown tossed a perfect spiral to Robby Anderson for a beautiful touchdown. 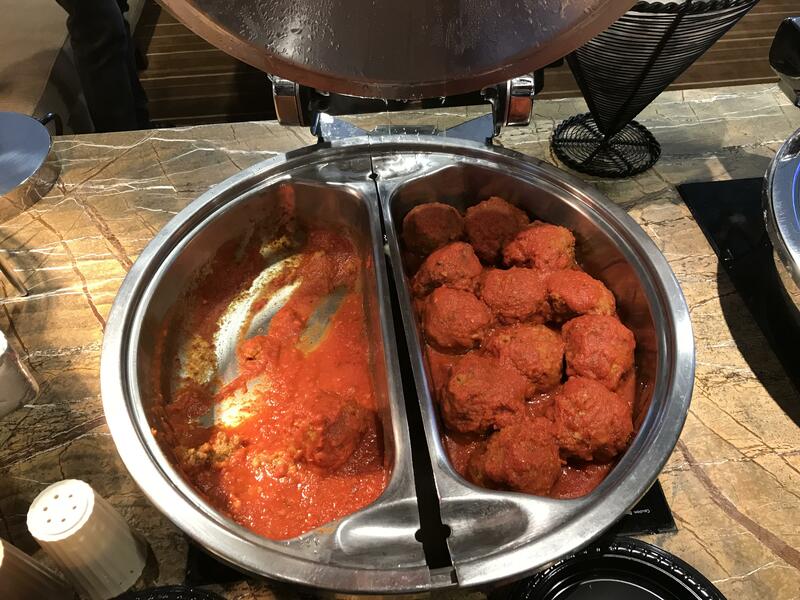 Of course you can’t have a good football game without some good eats! 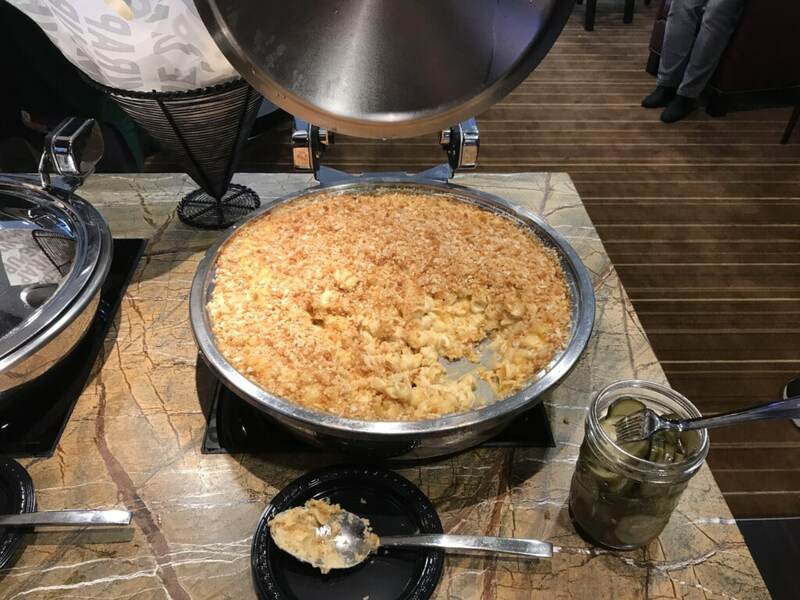 And the Jets crew really took care of us with a slew of some of the stadium’s newest offerings including three types of pork, an insanely good sweet and spicy buffalo chicken sandwich, meatballs, cornbread, Texas toast, homemade macaroni and cheese and even dessert empanadas. The rain continued to increase as the day went on, though thankfully we were nice and dry inside. 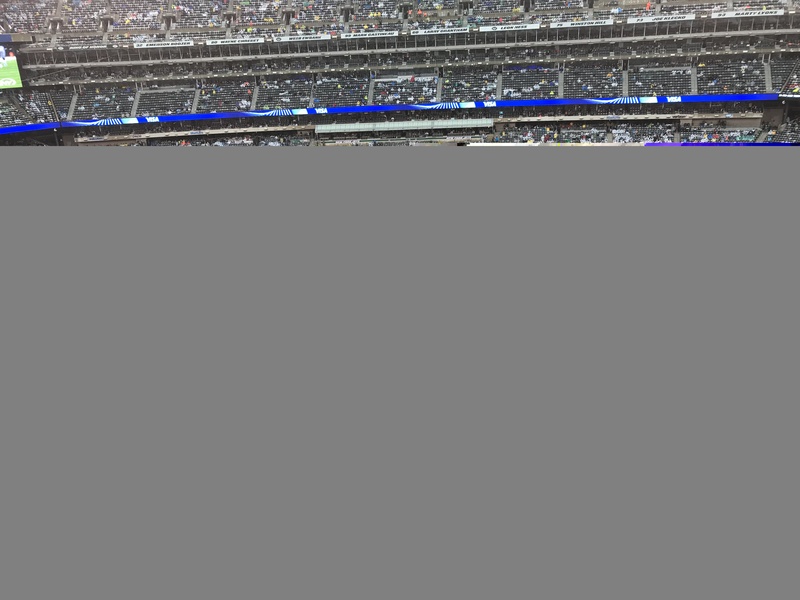 From our seats, though, the main windows did open so we had an unobstructed view of the field. Not to mention the brisk chill of the wind and the awesome roar of the crowd. The Jets may have lost the game, but honestly, Ryan and I both felt like winners after experiencing a real NFL game as a VIP. 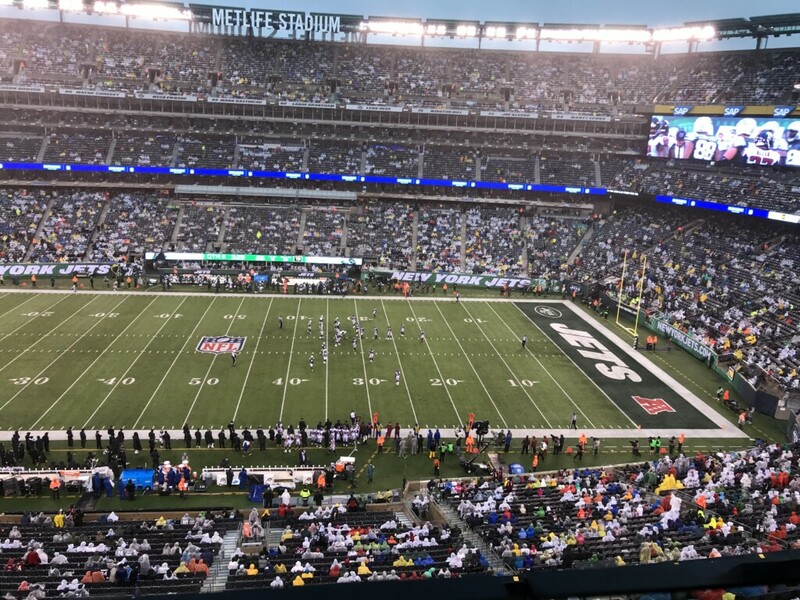 If you’ve never attended a live NFL game, it’s definitely a memorable event. And if you’re lucky enough to get the VIP Treatment, well, you may be spoiled just a bit for your next visit. One thing Ryan and I really learned from the experience though? Jets fans really love to spell. As in J-E-T-S. 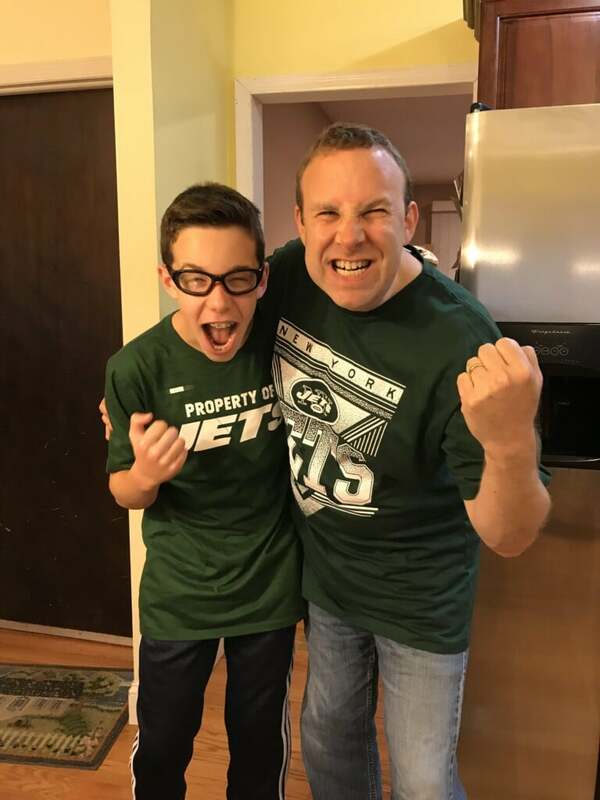 JETS! JETS! JETS! 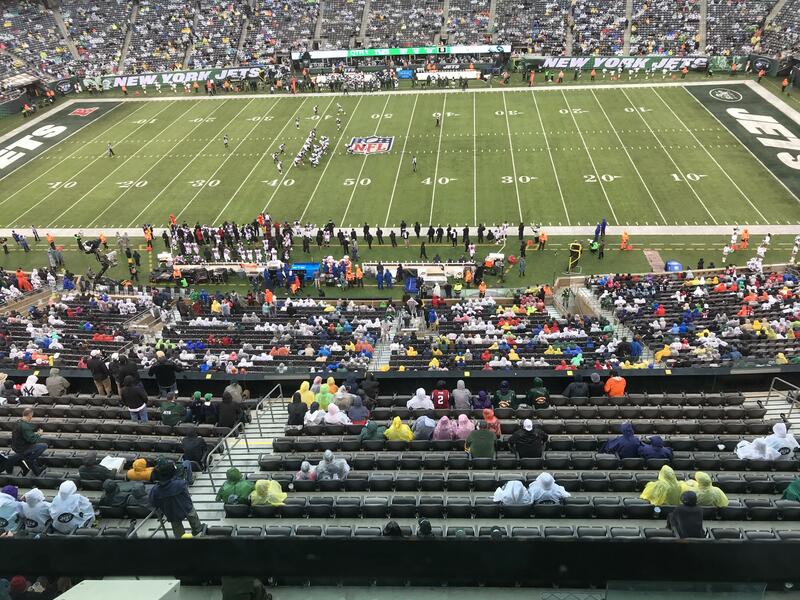 Have you ever been to a live NFL game? Sounds like a good time to me and the food looks delicious! What great memories made for you and your son. What an experience! Getting to be on the sidelines during warm ups and right there in the tunnel? 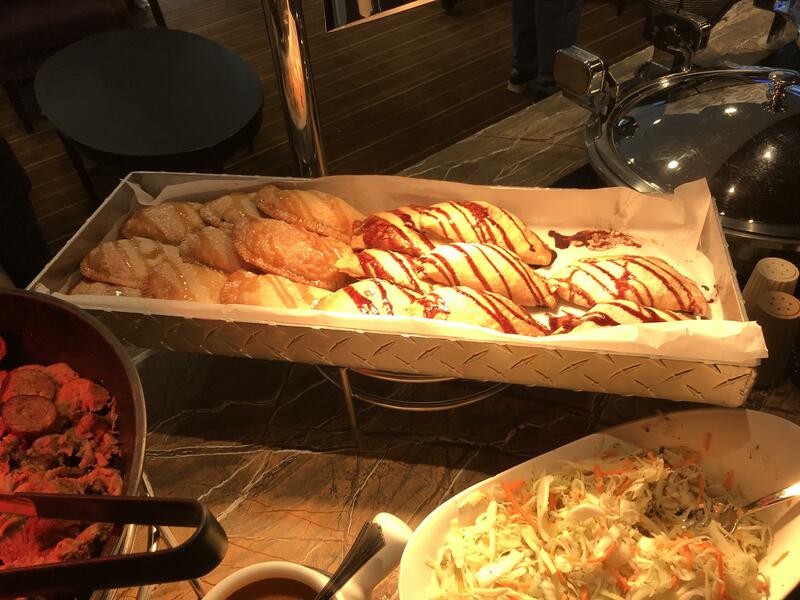 What a nice food spread too! I bet that is one day you and your son will never forget,rain and all! We love the Packers in my house!! Looks like you made many good memories that day, for sure. Looks fun and exciting. Go Bills! That is so cool. I’ve been to many Major League games and toured many Ballparks but yet to make it to an NFL game. Thanks for sharing your experience. This looks very exciting. It sounds like you had a great time. I’ve seen Dallas and Tampa play live. It was fun. I have never been to a live game. This looks like a BLAST!!! You all had so much fun and it shows in the pictures! I am jealous! I’ve been to quite a few games. I grew up in Skins territory! I love that you were able to share that experience with Ryan!